Average sold price for both detached single family (DSF) and attached single family (ASF) homes reached another record high, climbing to $451,429 and 297,697, respectively. Active inventory rose compared to last year, which is some good news for buyers, but there still is a notable undersupply of DSF homes at all price points. The speed of the market – with 60 percent of DSF and nearly 69 percent of ASF homes going under contract in 7 days or less – resulted in 65 percent of homes being sold at or above asking price. A feeling of “slowing”: It is expected that inventory will increase while the number of units going under contract or sold will decrease. Sellers looking to list in the later part of summer should price “in” the market, rather than “over,” to adjust for less buyer activity. Inventory remains low: Inventory is expected to increase heading into the latter half of summer, but it will still remain well below the six-month supply needed for a balanced market. The speed of the market slows: The percentage of listings that go under contract in seven days or less is expected to peak in May/June and cool as more properties enter the market and buyer activity decreases. Recently, Redfin reported that Denver was the hottest real estate market in the nation based on the percentage of homes likely to sell within two weeks of listing. With activity historically peaking in May and June, what might we expect for the next couple months based on trends over the past two years? And what about in a year? If current pricing and sales trends continue and interest rates rise, experts predict the average sales price of DSF homes will rise to just below half a million to $491,606. 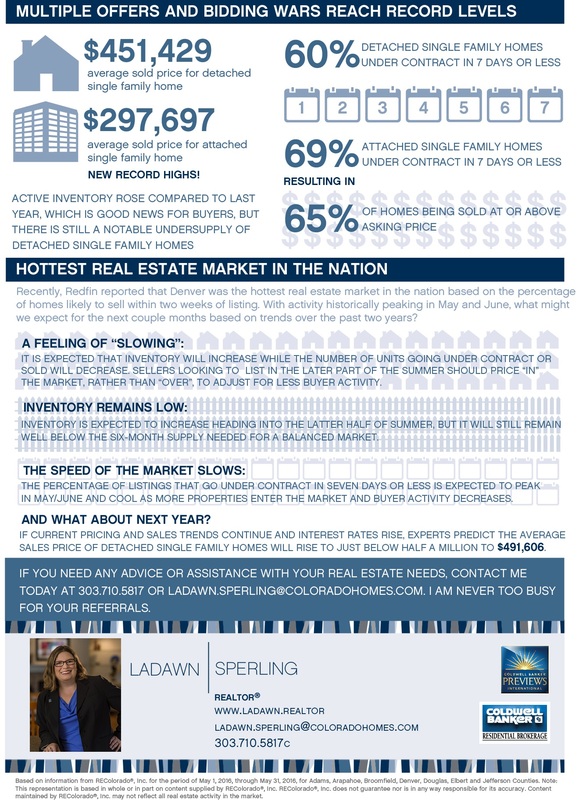 If you need any advice or assistance with your real estate needs, contact me today at 303.710.5817 or LaDawn.Sperling@coloradohomes.com. I am never too busy for your referrals. Based on information provided by Land Title from REColorado®, Inc. for the period of May 1, 2016, through May 31, 2016, for Adams, Arapahoe, Broomfield, Denver, Douglas, Elbert and Jefferson Counties. Note: This representation is based in whole or in part on content supplied by REColorado®, Inc. REColorado®, Inc. does not guarantee nor is in any way responsible for its accuracy. Content maintained by REColorado®, Inc. may not reflect all real estate activity in the market.